See also these photos by David Dyer-Bennet, used by permission. 11/14/07. Peg will be both reading from The Wild Swans and also reading a new scholarly paper at the Fantasy Matters conference at the U of MN over the weekend of 11/16-18/07. Both sessions are open to the public. Peg’s reading is at 8:30 a.m. on Saturday. I think her paper is scheduled later that same day. (Some events at the conference are limited to conference members, including the keynote addresses by Neil Gaiman & Jack Zipes). On Tuesday, March 22, Peg Kerr will be reading at DreamHaven Books and Comics from 6:30-8pm. This event is part of the Speculations Readings Series, a co-production of SF Minnesota and S.A.S.E. – The Write Place. Peg will read from the ice palace novel-in-progress. DreamHaven Books is located at 912 West Lake Street in Minneapolis, just a few blocks off Lyndale. There is free parking in the back or on the street. “A breathtaking book.”–Lois McMaster Bujold, author of many SF & F novels, including The Curse of Chalion. “As intricately woven as the nettle shirts Eliza makes for her swan brothers, this moving book will remain with me for a long time.”–Jane Yolen, poet-writer of many books, including Briar Rose. “Breaks new ground . . . a challenging, deeply moving book.” –Patricia C. Wrede, author of such fantasy novels as the “Enchanted Forest Chronicles,” and Snow White and Rose Red. “Before the end, the homely and poetic detail, the lovingly-drawn characters, the enormous tension created by the weaving together of two times, make it impossible to stop. As you sit there dripping tears on the last pages, all you can really think is that love sometimes does not falter, and that when it does, sometimes it will pick itself up and try again.” –Pamela Dean, novelist author of Tam Lin and other books. Two struggles. Two curses. Two tales. One truth. Suddenly, the stories fit together. In case it’s not clear, this is a retelling of Hans Christian Andersen’s “The Wild Swans” in two historical settings: 17th-century New England, and New York City in 1981 (or so). The two narratives are braided together with the unrepeated original story by Andersen, with all of its mythic and fairy tale echoes, to form something greater than any of the three alone. The varied and changing repetition of the story elements brings an incantory power to particularly the more-or-less present-day story that resonates tragically in both dreams and nightmares, as well as in the newspapers and electoral politics of our everyday lives in twenty-first century America. Warner Books ISBN 0-446-67366-8 $13.99 (in Canada: $17.99) 400 pages. Peg’s interview of Tim Powers is also available via TV Bookshelf. 5/22/03. Peg explained that this was a good time to lay claim to her own domain name, and she also wanted to have space for “hosting pictures, and to imbed my LiveJournal in an author’s page, and a whole host of other things . . . well, we’ll see what I’ll do with it.” I don’t know what this will mean for keeping up this page. I’m certainly not going to put in a lot of effort to duplicate what Peg puts on her own page, but I also have some unique content here. Probably I’ll eventually delete the bibliography, etc. But it’s also true that I haven’t updated these pages very well in a while. It’s possible that I might get back to them on a more regular basis later in summer or fall 2003. I’m moving, and it’s going to take a couple of months to straighten out all of my situation. Peg will be on another Harry Potter panel at the U of M on Wednesday, Nov. 20–2:15 p.m., in the Andersen Library, sponsored by the Children’s Literature Research Collections of the University of Minnesota Libraries, and the Rivendell Group. featuring Peg along with Prof. Lee Galda of the College of Education at the U of M.
Peg read from two new works in progress at the World Fantasy Convention in Minneapolis over Oct. 31-Nov. 3: a new story, set in the Twin Cities and featuring the Winter Carnival and the Aquatennial, and a new “letter-game” story being written with Kij Johnson. from 10:30 a.m. – 11:30 a.m.
Lyda Morehouse, Anna Waltz, and Shari Mann , aka S.N. Arly. They’ll be talking about the process of writing science fiction, and answering questions. Books will be available for sale. Refreshments. Subject: I have a LiveJournal! my website, prominently displayed near the top if possible. Thanks! Comment from David: In just a couple of weeks, there’s already enough new info and writing from Peg to make up for the many months this page has languished without updates. 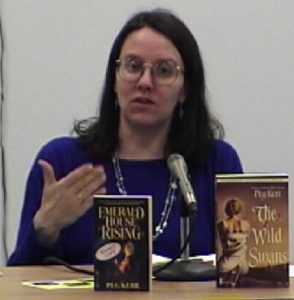 Peg discusses some of the events in her life, her long experience with a sort of writers’ block, some of the books she’s been reading, and some of her various writing projects. Incidentally, she did read a fine story at the December program mentioned just below in the November 01 entry. Also, it’s perhaps worth mentioning that the Wild Swans discussion group has been active again, lately (see the Dec. 00 entry, below). 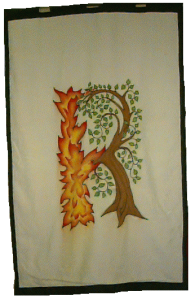 Peg may read a new story at the December 8 “Readings from Rivendell” program at Dreamhaven Books in Minneapolis. The Wild Swans mass market paperback is out. April 7, at the Southdale Public Library, 1:30 p.m. a panel discussion featuring experts on and writers of children’s fantasy. Laura Krentz, a Hennepin County children’s librarian and coordinator of the Children’s Fantasy bi-monthly correspondence circular, Once Upon a Time. Claire Lenander, an 11-year-old member of the Mythopoeic Fantasy Award committee. including her latest book, When the King Comes Home. This program was co-sponsored by the Southdale Public Library, the Rivendell Group of the Mythopoeic Society and The Minnesota Science Fiction Society (Minn-Stf). I just got an email from Betsy Mitchell, letting me know that they are going to be re-releasing Swans as a mass market paperback next November. sponsored by the Gaylactic Network. The Wild Swans is a finalist for The Spectrum Award, sponsored by the Gaylactic Network. The Wild Swans is a finalist for the Mythopoeic Fantasy Award. Einblatt from July 95 to date is on the web at http://www.mnstf.org/einblatt/. Einblatt is distributed via e-mailing-list ­ send e-mail to einblatt-list-subscribe@mnstf.org. The Wild Swans is on the preliminary list of nominees for the Mythopoeic Fantasy Award,. On the other hand, the March Mythprint contains a letter questioning the wisdom and artistic success of combining two dissimilar stories in The Wild Swans. The San Francisco/San Jose metro area group, Khazad-dum, of the Mythopoeic Society [http://www.mythsoc.org/groups/kd], is discussing Peg’s Wild Swanson February 13. Emerald House Rising, Warner Aspect, June 1997. The Wild Swans, Warner Aspect, April 1999. “Analog Anniversary.” Minnesota Technolog. April 1991, Vol 71, No. 5, pp. 20-22. “Curses.” Amazing Stories. July 1990. Vol 65, No. 2 (Whole Number 553), pp. 90-99. “Debt in Kind.” Weird Tales. Fall 1990. Vol. 52, No. 1 (Whole No. 298), pp. 105-110. “Free Day.” Tales of the Unanticipated. Spring 1987, Number 2, pp. 19-22. “Free Day.” Nowa Fantastyka. (Publication in Polish translation forthcorming). “Lethe.” Full Spectrum 3. Lou Aronica, Amy Stout, and Betsy Mitchell, eds. New York: Doubleday, 1991. “Miss Pemberly.” Pulphouse: The Hardback Magazine. Issue Three, Spring 1989, pp. 3-8. “Treefall.” Tales of the Unanticipated. Winter/Spring 1988, Number 3, pp. 54-55. “Watching.” Tales of the Unanticipated. Spring/Summer 1989, Number 5, pp. 54-55. “Between Books.” A View from the Loft, Ellen Hawley, ed., December, 1999, Vol. 22 No. 5, p. 4, 14-15. 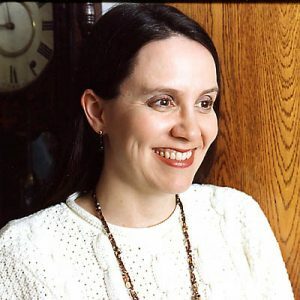 “Imagining a Woman’s Future: Interview with Eleanor Arnason.” Minnesota Women’s Press. July 1-14, 1992, p. 9. Unanticipated. Winter/Spring/Summer 1991, Number 8, pp. 32-38.
Review of Cowboy Feng’s Space Bar and Grill by Steven Brust. Minnesota Daily February 21, 1990, p. 9. “The Woman Who is Saddam Hussein.” Minnesota Women’s Press. March 13, 1991, p. 4. “Wielding the Meatax.” A View from the Loft, Ellen Hawley, ed., December 1997, Vol. 20 No. 5, p. 5, 10-11. Pictured: Peg, with baby Delia, at the Rivendell Hobbits’ Birthday Party at Andy & John Terwilligers’, September, 1996. Photo by D. Lenander, used by permission. Peg Kerr was born in a Chicago suburb, moved to Minnesota in attend St. Olaf College, and has stayed in Minnesota ever since. With $50.00 from her first paycheck from her first job out of college, she registered for a science fiction and fantasy writing class. There, she met her husband and wrote the first story she ever sold. In hindsight, this is all quite pleasant consolation for the fact that she was fired from her job the day the class started. 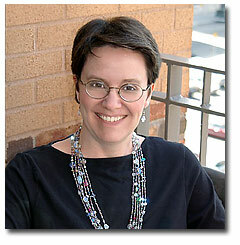 She attended the Clarion Writers Workshop in 1988 and has an M.A. in English Literature, specializing in speculative fiction. 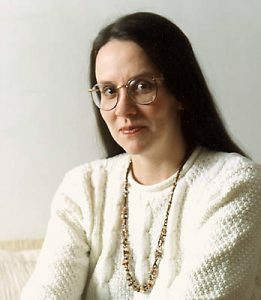 Her fiction has appeared in Fantasy and Science Fiction, Amazing Stories, Weird Tales, and various other magazines and anthologies (see attached bibliography). Emerald House Rising is her first novel. The Wild Swans, a stand-alone fantasy based on the Hans Christian Andersen fairy tale is her second. She presently lives in Minneapolis with her husband and two daughters. Mythprint review of EHR by David Lenander.